Our PGA VILLAGE 7 room Golf Villa with 7 room that sleeps up to 12 people in PGA Village. 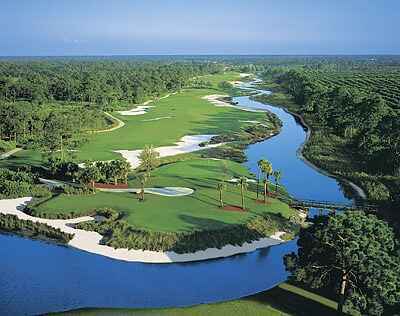 Stay at a first class golf resort with three world class golf courses designed by world renowned Tom Fazio & Pete Dye. We are happy to offer you accommodation with PGA Village best location. This unit is the closest unit to the Clubhouse and driving range overlooking the first tee and fairway of the first hole on Tom Fazio’s Ryder Course. Why rent a hotel room when you can get much more?! Depending on the size of your party, enjoy up to 6 bedroom lock-out GOLF RESORT VILLA WITH FULLY EQUIPPED KITCHEN AND 2 PATIOS (2-12 pers. approximately 1500sf) Each Bedroom has 1 King Size Bed or 2 Twin Size Beds Fully equipped kitchen, 3 bathrooms, 2 private patios with B.B.Q grill and outdoor furniture overlooking golf course Upon reserving a golf villa with us, we can get you discounts up to 70% off on courses such as: Champions Club at Summerfield, Hammock Creek, Palm Cove, St James (about 20 min drive) & Binks Forest, Presidential (about 40 min drive) Enjoy a 50 inch screen TVs and 6 26-32 inch flat screens. Each room can be set up with 1 king size bed or 2 twin size beds. We are happy to offer you accommodation with the best location in the heart of golfer’s paradise in PGA Village. The PGA Village Resort - Ranked among the "75 Best Golf Resorts" by Golf Digest Golf Villas – our Golf Villas are the closest to the club house – why stay anywhere else!? Owned and operated by The PGA of America, and ranked among the "75 Best Golf Resorts" by Golf Digest, PGA Village in Port St. Lucie, Fla., serves as your Ultimate Golf Destination. PGA Village features the PGA Golf Club, with 54 holes of Championship golf by Tom Fazio and Pete Dye; PGA Center for Golf Learning and Performance golf instruction, practice, technology and fitness park; and the PGA Historical Center golf museum, home to the Ryder Cup Trophy. This Golf Resort is an alluring property features 54 holes of championship golf, villas with a bold, contemporary décor, lush landscaping, and expansive water features.